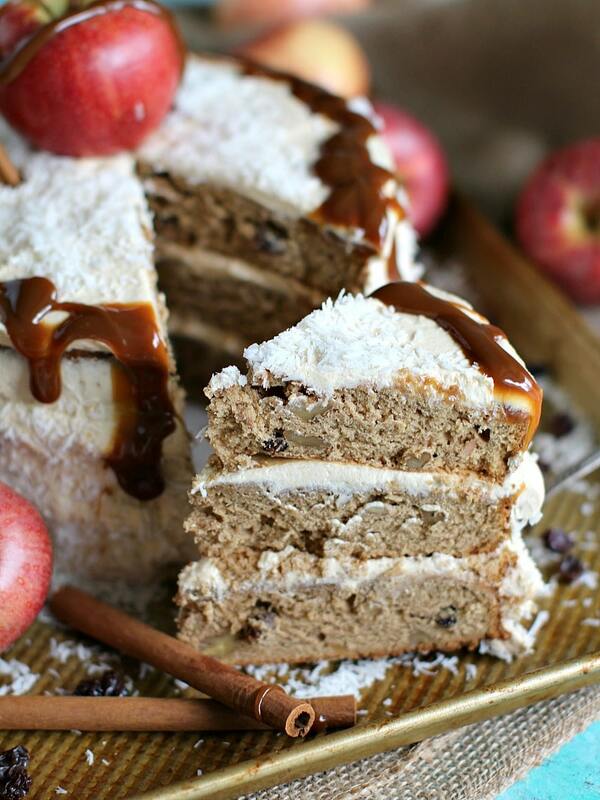 Apple Butter Cake with Dulce de Leche Buttercream loaded with walnuts and raisins, it is such a stunning, decadent and luxurious dessert to make this fall. Fall desserts are one of my favorite things about the season, starting with a perfect Cinnamon Coffee Cake, up to a Pumpkin Cheesecake and obviously some sweet Apple Cider. These delicious fall desserts will warm up your soul and tame your sweet tooth, no matter how cold it may be outside. 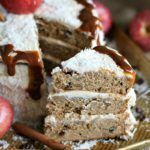 This Apple Butter Cake is one of the most amazing desserts you can make to celebrate the season. Because the texture of this cake is outstanding, and its one of the best flavor combos out there! The cake is covered in a blanket of creamy Dulce de Leche Buttercream and some shredded coconut for chewiness. 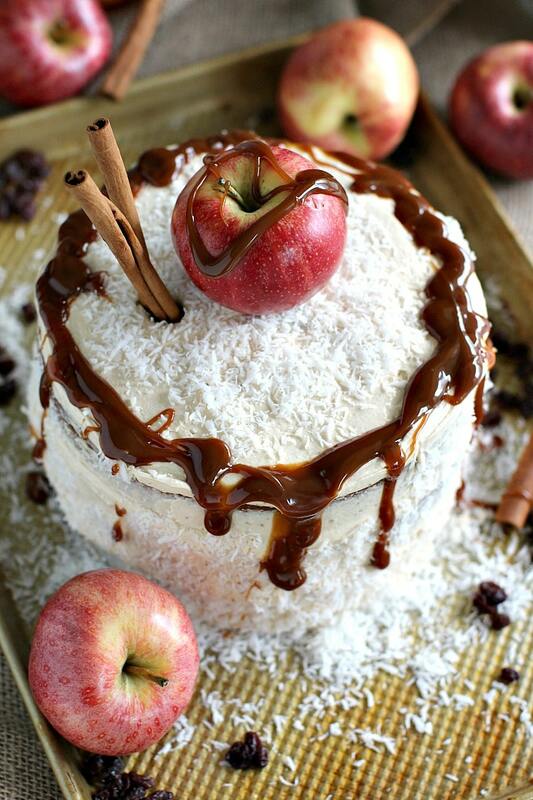 Topping the cake with a fresh apple, cinnamon sticks, coconut and a caramel drizzle are all easy options that will make your delicious dessert look absolutely stunning. 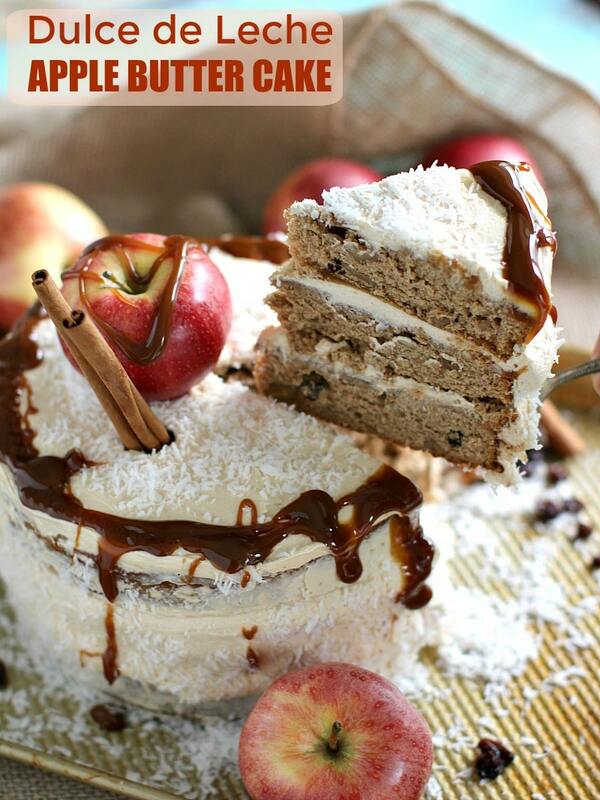 The cake is full of delicious fall flavors! The apple butter adds a beautiful apple flavor without the hassle of peeling and cooking the apples! It adds such a nice softness and richness to each crumb, and it compliments nicely with the chewy raisins and crunchy walnuts. 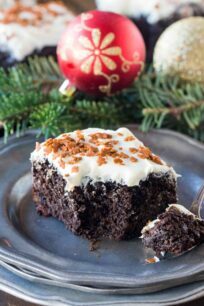 As a result of these mixes, this cake turned out to be flavorful, moist, and just perfect. The sauce – is a semi-solid food made from apples, a liquid (apple juice, cider, or water), spices, and sometimes sugar. Applesauce is cooked down until the apples soften so they can be mashed or pureed. Applesauce is cooked usually between one hour to a couple of hours. The butter – regardless of the name, it does not contain any butter, but it gets its name because of its dense, spread like consistency. Apple Butter is made from apples, a liquid (apple juice and/or cider), sugar, and spices. The combination is cooked slowly over low heat from a couple of hours to sometimes a few days, in order to achieve the desired thickness. Can you replace apple butter with applesauce? Yes, you can replace it in this recipe, 1:1 ratio, however, keep in mind that your cake will be just slightly lighter, as the applesauce consistency is more watery. TIP: If you only have applesauce on hand, you can make a super quick version of “apple butter”. Add the applesauce to a small sauce pan over medium heat and add some sugar and a spoon of apple cider vinegar. Stir and cook until it starts to thicken. You can replace the apple butter with apple sauce, see the notes above. Use high quality apple butter, because it has a richer taste. You can use sugar free apple batter. The raisins can be skipped, or replaced with dried cranberries. The walnuts can be skipped or replaced with pecans. 1 cup of chopped apples can be added to the batter as well. Caramel is made with a with a mix of water, heavy whipping cream, sugar, and butter. It also has a more watery, pourable consistency. Dulce de leche is made with milk, sugar, and sometimes cinnamon or condensed milk that has been simmered for hours. It has a thicker consistency and a darker color. Yes, you can. Buttercream cakes freeze especially well, but note, that once you start thawing the cake, sometimes you will get condensation on the cake, that happens when you are trying to speed up the thawing process. Make sure the cake is refrigerated, so the buttercream won’t spread when you try to wrap the cake in plastic wrap. 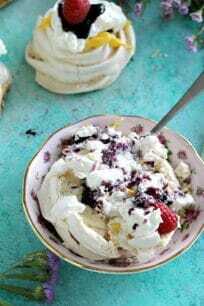 In the large bowl of a stand mixer fitted with the wire whisk attachment, beat butter with sugars on medium-high speed until well blended, fluffy and creamy, about 3 minutes. On low speed, beat in the flour mixture in 3 additions, alternating with apple butter in 3 additions, into the butter mix , whisk until just blended. Stop to scrape the sides and bottom of the bowl with a spatula. With a spatula, manually stir in walnuts and raisins until well incorporated into the batter. Bake for 30 minutes or until a wooden pick inserted into the centers of the cakes comes out clean. Remove pans from oven, let them cool on a wire rack for 10 minutes. Run a knife around the sides of cakes and invert cakes onto the rack. Remove and discard parchment paper. In the bowl of a stand mixer fitted with the wire whisk, mix together sugar and butter on low speed until well blended. Add vanilla extract and Dulce de Leche, mix until well combined, stopping a few times to scrape the sides and bottom of the bowl. Increase speed to medium and beat for another 3 minutes, light and creamy. 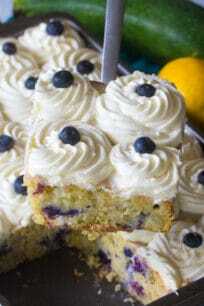 Place a cake layer onto a cake platter and spread with 3/4 cup frosting. Top with other cake layer and repeat. Add the third, top cake layer and spread with frosting. Use the remaining frosting to spread on the sides of the cake. If desired cover cake in shredded coconut or toasted coconut for extra flavor. Just before serving, drizzle some caramel sauce on the edges of the top cake layer, and decorate with a few cinnamon sticks and top with a fresh apple. That is one gorgeous cake! I’m requesting this for my next birthday. You totally should, the cake is amazing! Whoa, that is one seriously gorgeous cake!!! Oh my goodness, that looks absolutely incredible, YUM! I love everything about this cake….especially the sound of the frosting!! Yes, the frosting is so good! Looks like a great fall cake. Love apple butter this time of year. This looks incredible! LOVING the apple butter and dulce de leech buttercream!! Wow what a cake, will try for my b-day! This cake is perfect for my mother’s birthday!